How will you use your glasses? You wear your spectacles all day, but don't have bifocals or multifocal (Progressive) lenses. You need them to see things in the distance, e.g. for driving, but can also leave them on for close vision. You wear them most of the time for general everyday use. You mostly need your spectacles to read things close to you: papers, documents etc., but do not need them to see things in the distance. You need these spectacles for when you're working on the computer or something else at arms length. Your spectacles have a definite line on the lenses which separates distance and near vision segments. Your prescription will contain a measurement called ADD. There is no line on the lenses of your spectacles but the bottom of the lenses is stronger for close work while the top of the lenses gives you clear distance vision. Multifocals (Progressives) give you both distance and near vision. What is my Pupillary Distance (PD)? Your papillary distance (PD) is the distance between the centre of one pupil to the centre of the other pupil while your vision is fixed on a distant target. 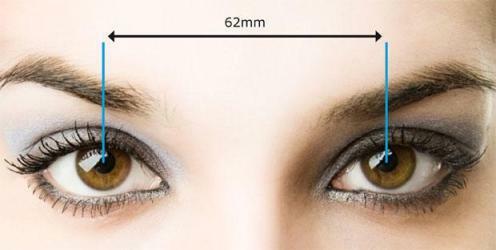 The industry standard is to have this measurement expressed in millimeters. This measurement is important in the making of your prescription spectacle as it ensures that the optical centres of your spectacles lenses are aligned to your pupil positions. Positioning lenses correctly in relation to the centre of the pupils is especially important for higher powered lenses (above 2 diopters). 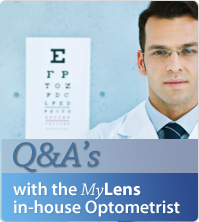 Your PD will be measured by your eyecare practitioner at the time of your eye test. Stand one meter (approximately) away from a mirror. With or without your spectacles on, close your right eye and centre the zero millimetre marker of a ruler at the centre of your left eye. To ensure the ruler is stable during the measurement, rest the ruler on the bridge of your nose during this procedure. Now, holding the ruler steady, open your right eye and close our left eye. Using your finger or thumb, mark the ruler where your right eye pupil centre is located. The millimetre mark of your thumb placement is your PD measurement. Complete this procedure three or more times to ensure consistency of your measurement. All lenses are hard coated. This reduces scratches. However, hard coat does not mean unscratchable. FREE! All lenses are multi coated. Anti-reflection coating to help eliminate distracting reflections, improving the cosmetic apperarance of your glasses and reducing glare from computers and night driving. FREE! This is a Permanent tint and does not change darkness. Choose this to order prescription sunglasses. UV protection is included for free. NEW! Lens coating that helps filter harmful blue light from your electronic devices (mobile phones and computers). 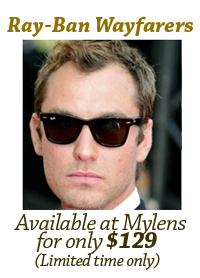 MyLens highly recommends this lens coating for all patients using electronic devices for extended periods of time. Lenses that darken outside and are clear indoors. Will go as dark as sunglasses outdoors during the day, and approximately half as dark as sunglasses inside a car. Need us to call you? The material provided on this site is for informational purposes only. Have your eyes examined regularly and always follow your eye care professional's instructions for the proper use and care of your contact lenses.